I’m a big fan of the sound of the autoharp, so when I saw one in a small second hand music shop in Hastings, I couldn’t help myself. It doesn’t work very well, it’s a real pain to tune, and the strings need changing, but it sounds lovely. The one I have was made in the 60s in Germany I believe. It was a cheaply produced instrument, but has survived reasonably well. I think the glistening resonance of the strings actually works really well with some of the effects I’ve been building so decided to make a demo. One of the trickiest parts of filming this demo was working out how to film from a top-down perspective with the camera. 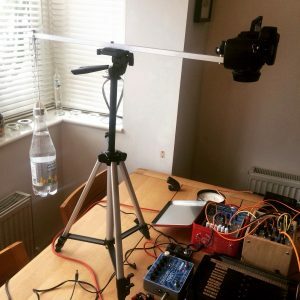 I fashioned a DIY arm that fits on the tripod with a bottle of water as a counter weight. It did the job but was rather precarious. I think a better long term solution is required!